Alternatives has sold its two properties. We purchased St. George’s Church at 270 Braidwood Avenue with the proceeds of the sale. We are excited to call the Braidwood neighbourhood our new home. The Braidwood Neighbourhood Project is more than a capital project. It is a revitalization initiative for the south end of Peterborough, bringing together various groups such as social service agencies, citizens and community organizations in a communal gathering place. It is a restoration project of a 105 year old church, which is being repurposed into a multipurpose, fully-accessible community space. To finish renovating and repairing our new home we need to raise $430,828. This includes the transformation of the former Chapel into a Community Hub, the installation of an accessible kitchen, the construction of an open studio for our day programs, the construction of accessibility ramps and elevators and the beautification of the exterior landscape. Collectively, a successful capital campaign will produce a fully inclusive and accessible community hub enabling people with disabilities to acquire the skills and supports to thrive and live a healthy, independent life. 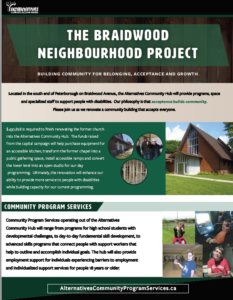 Making a charitable gift to the Braidwood Neighbourhood Project will help build a brighter future for our clients and the Peterborough community as a whole. The following information may be helpful as you consider various ways to support the Alternatives Community Hub. A multi-year pledge – gifts pledges over 3 to 5 years may bemade to the capital campaign, to be paid monthly, quarterly, semi-annually or annually. One-time gifts – donations can be made by cash, cheque or online. Gifts of Stock, Securities or Share – receive a charitable tax receipt for the fair market value of the donated security and don’t pay tax on any capital gain. Tribute gifts – donations made in memory or in honour of a special person or loved one is a meaningful way to establish a lasting legacy. Please help us build Braidwood and create an inclusive, accessible community hub for people with disabilities.